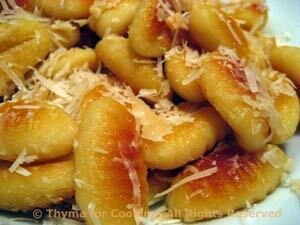 Fried Gnocchi finished with Garlic, Parmesan, Thyme for Cooking healthy gourmet. The gnocchi are boiled first, then fried until brown and crispy on the outside and finished with garlic, olive oil and Parmesan. They stay soft and chewy on the inside. Heat 1 tbs oil in a medium nonstick skillet. Add gnocchi and sauté until light brown, stirring and turning occasionally. Mince the garlic and add to skillet when gnocchi start to brown, and cook for at least 5 minutes longer. Put gnocchi and garlic into a serving bowl. Drizzle with 1 tbs good olive oil, sprinkle with Parmesan and serve.